On the surface, the Eagles’ beatdown of the Cowboys in Texas on Thanksgiving should portend very bad things for those hoping for a competitive night Sunday when Dallas plays a potential NFC East title game in December, at night, for the fourth year in a row. • 2011, Week 17: The 8-7 Giants beat the 8-7 Cowboys 31-14 to win the NFC East. Dallas stays home. New York wins the Super Bowl. • 2012, Week 17: Washington (9-6) beats Dallas (8-7), 28-18, to win the NFC East. Dallas stays home. Washington loses a wild-card game. • 2013, Week 17: The 9-6 Eagles beat the 8-7 Cowboys (this is not a recording), 24-22, to win the NFC East. Dallas stays home. Philly loses a wild-card game. • 2014, Week 15: The 9-4 Eagles host the 9-4 Cowboys in a game a lot more important to Dallas than to Philadelphia because of Dallas’ 33-10 loss to the Eagles on Thanksgiving. A Philadelphia win Sunday night gives the Eagles a series sweep and a 4-0 division record; Dallas would be 2-3 in division games with a loss. The one thing you don’t want to do in the NFC East is leave your chances to a road game at the big, bad Eagles in December. But that’s what Dallas has done. The one difference this year: In the previous three seasons, the NFC East title game has been the 256th and final game of the NFL regular season. This year, it’s the 223rd game of the NFL season … but in many ways, it feels like it has the same sort of finality to it. 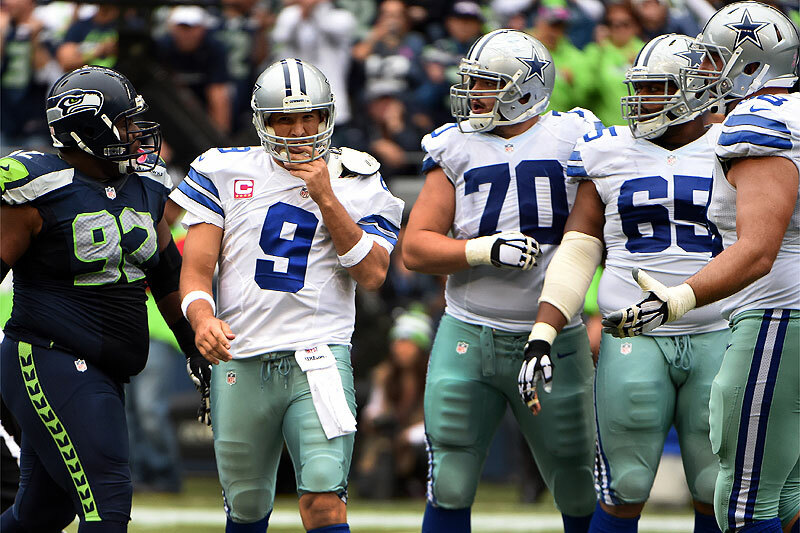 Is Romo Small in Big Games? The age-old debate emerges again as the Cowboys head into a stretch of three must-win games, and Greg Bedard breaks down past results to find the answer. In watching the Thanksgiving game again, what was striking was the inconsistent play of the Dallas offensive line—and the penetration in particular of defensive tackle Fletcher Cox and end Vinny Curry. Conversely, it was an atypical day for the Dallas offensive line, which has shined most of the season. The Cowboys just seemed off. 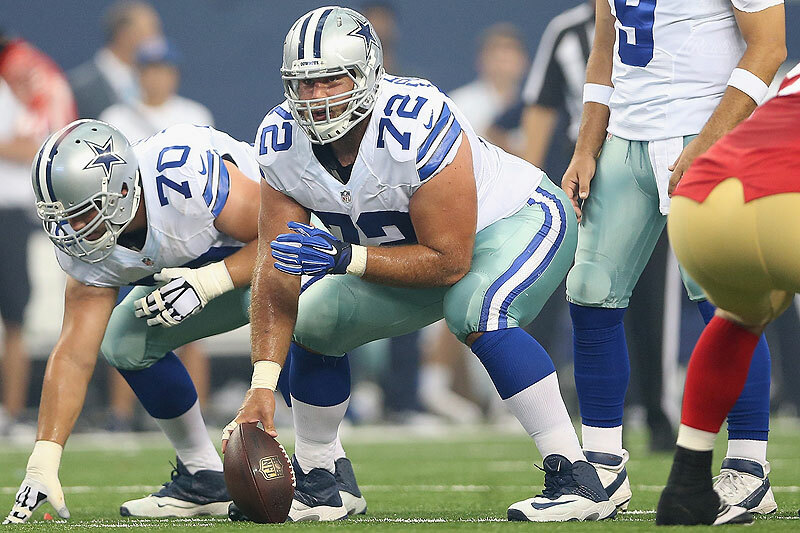 Curry sacked Tony Romo when center Travis Frederick snapped the ball slightly early to Romo. 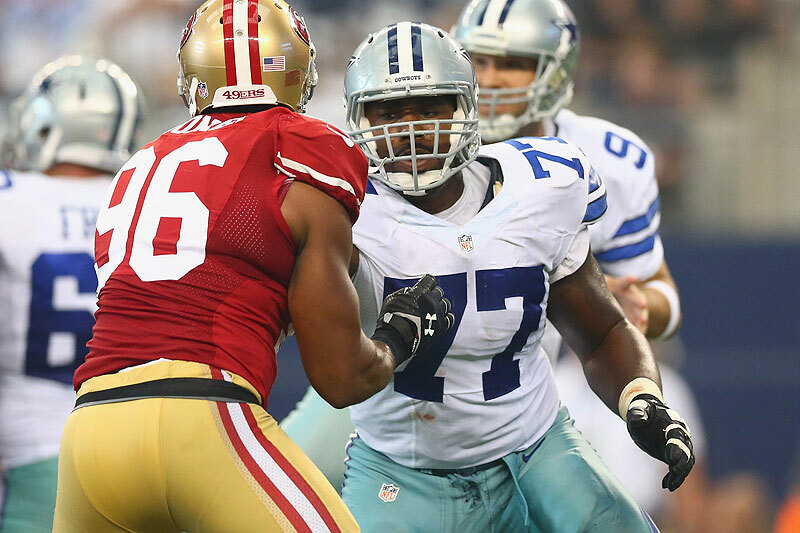 Left tackle Tyron Smith wasn’t ready for the snap, and the leakage from Smith’s side resulted in the sack. "The timing was a small portion of it," Frederick said after practice Thursday afternoon. “Pretty small, really. We both had issues. We had to travel on the front end of the week, but Philly had to travel on the back end. We both had to face issues that day. What happened that day, looking back, is we just weren’t ready for some of the things in their gameplan. And we just didn’t play well. We feel like we’ll be better prepared for what they throw at us this week." Left tackle—Tyron Smith was the ninth overall pick in 2011. He turns 24 Friday. At 6-foot-5, 308 and with long arms for his position, Smith is tough to beat around the edge and a competitive guy who jousts until the whistle—or a millisecond after. A pro’s pro, with a long career ahead of him. 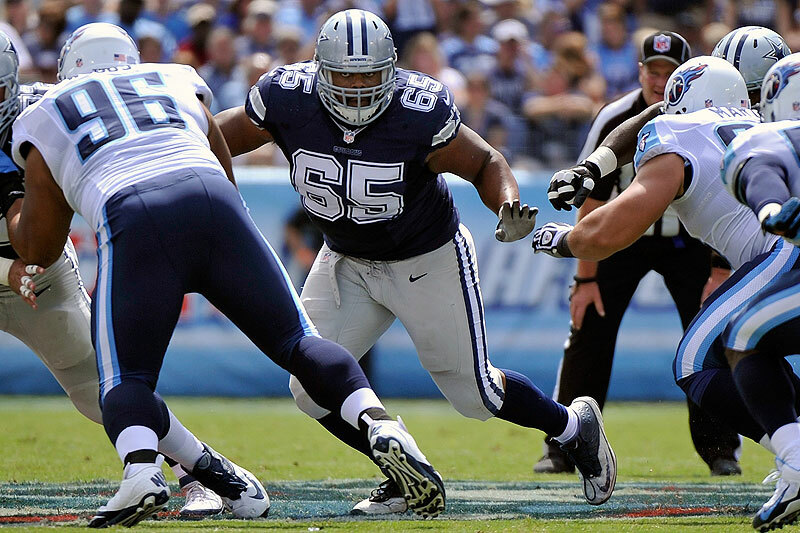 Left guard—The unknown guy, Ronald Leary, who has far outplayed his pedigree. He is 25. The only undrafted college free agent on the line, the 6-3, 318-pound Leary was found at Memphis by scouting director Tom Ciskowski’s staff and signed after the 2012 draft. He spent the 2012 on the practice squad and won the starting job in camp in 2013. “He talks like a veteran, sees plays like a veteran, and gets overlooked because of the three first-round picks on the line, but he shouldn’t," Frederick said. Center—Dallas picked Frederick 31st overall in 2013, an upset because he was projected to go in the second or third round. He is 23. Good thing the Joneses didn’t pick by the draftniks’ board, because Frederick has been terrific, the glue to the line since the day he walked on campus. Frederick has started every game since being drafted—and played all 1,893 offensive snaps of the Cowboys in the past two years. 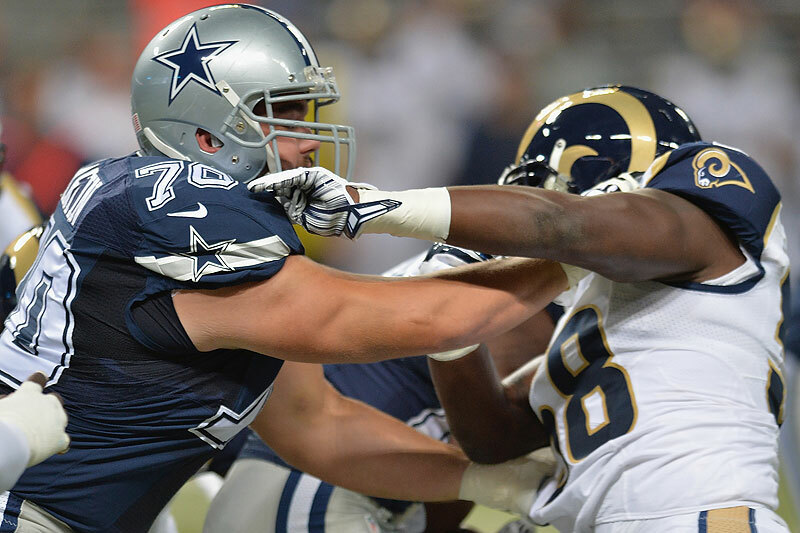 Right guard—Zack Martin, the 6-4, 308-pound rookie from Notre Dame, is an Offensive Rookie of the Year candidate. He is 24. As with Smith and Frederick, Martin was a ready-to-start player coming out of college (he started all four years for the Irish) and hasn’t disappointed. “From the day he walked in," said Frederick, “he’s never played like a rookie. He’s got this really weird ability—I’ve never seen it before—to put himself in a bad position and recover so fast he gets in position to make the play." 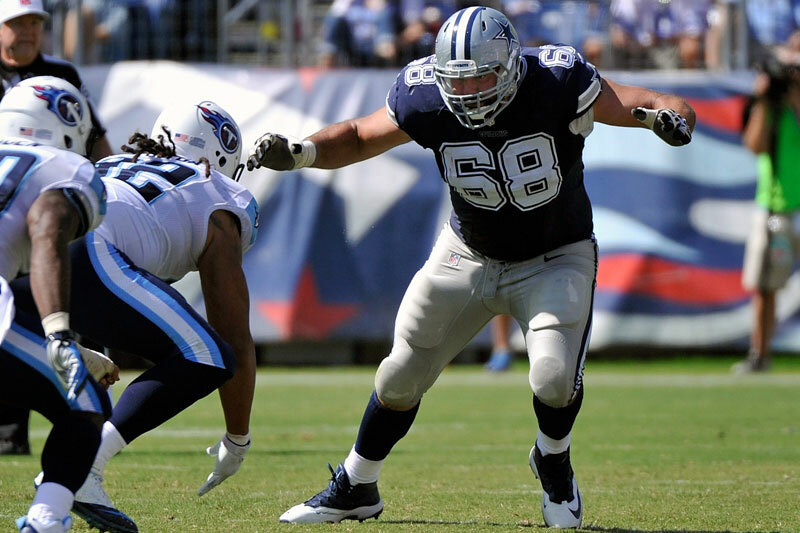 Right tackle—Doug Free, the old man of the group (30), is 6-6 and 325, and he played left tackle before Smith in an up-and-down career since being the Cowboys’ fourth-round pick in 2007. He’s found a niche at right tackle, playing very well over the past month during some of the Cowboys’ most dominant offensive performances. "I think one of the real important things for us is how we’ve been able to mesh together pretty quickly," said Frederick. “We get along well as a group. We work together, we go out together—it started last year, and continued after Zack joined this year." What’s interesting about the Dallas line’s play on Thanksgiving was how uncharacteristic it was compared to previous weeks. America watched that Sunday night game in New Jersey as the line was superb in keeping the Giants’ four-man front at bay on the winning Dallas scoring drive. On two particularly memorable plays, the line gave Romo 7.61 seconds and 8.99 seconds (per NBC director Fred Gaudelli’s stopwatch on the screen that night) to throw. Re-watching this drive, the first play—the one with the 7.61-second time for Romo to throw—was particularly notable, because each side of the Giants’ four-man front stunted, causing the guard and tackle on either side to change assignments. Execution was flawless, as Romo found Jason Witten for a 15-yard gain. The longer protection time saw Smith neutralize Jason Pierre-Paul in a classic mano-a-mano matchup that turned into a wrestling match. In the next game, though, Philadelphia’s interior strength was a big factor. Cox and Bennie Logan will be a load, again, for the interior three to handle this weekend. What’s most important is for Dallas to control the ball so Philadelphia can’t make this a track meet. With how fast Philadelphia plays (the Eagles ran 75 plays in the first meeting), Dallas has to play an old-fashioned, Bill Parcells-clockball game, controlling time of possession as much to wear down the Eagles as to keep the ball from the dangerous offense’s hands. "Every time we play Philadelphia, it feels like a playoff game," said Frederick, who has learned this in all of three games of the rivalry. “It’s the next game on our schedule, but we know how important it is." Important, too, for a very good offensive line to redeem itself. Arizona 12, St. Louis 6. Let’s just put it out there: The real triumph for the Cardinals is not being 1.5 games up on Seattle entering the weekend. The real triumph is virtually clinching a playoff spot with the amount of injuries the team has endured this year. It did so with a defensively dominating win featuring only field goals in St. Louis on Thursday night. "I have never been prouder of a group of guys in my life—at any level of football, with any team I have been associated," Arians told me early Friday morning from St. Louis. “They listened to everything all week, like this St. Louis team was 12-1 instead of 6-7. How great they were. All that crap. Well, we’re pretty good too. And our guys … we can run it pretty good. And they’re not beating us with [Rams quarterback] Shaun Hill." But who will the Cardinals use at quarterback the rest of the way? It appears as though the Cards have lost their second starting quarterback to a knee injury now. Drew Stanton is due for an MRI this morning in Arizona. “It could be an old injury," said Arians, referring to a previous Stanton knee injury. “We’ll find out when we get him in the [MRI] tube." We keep asking, How many more injuries can this downtrodden team take? What would be amazing is Arizona hosting Seattle next weekend with Ryan Lindley (career: 51 percent accuracy, zero touchdowns, seven interceptions, 46.8 rating) holding the NFC West chances in his hands. But watching the Cardinals this year, you have to know one thing: That defense means Arizona is never out of it. Watching the reborn Frostee Rucker and Larry Foote in St. Louis, it was evident that both have come alive under defensive coordinator Todd Bowles. And they may not beat Seattle next week. They may not win the division. But if the Cards are the fifth seed, they will make the NFC South champ shudder. This is shaping up to be a very interesting playoff race, even if Arizona has to play the third-string quarterback, with zero career touchdown passes, to win in January. Derek Anderson, quarterback, Carolina (number 3). “He looks like a starting quarterback," said Tampa Bay coach Lovie Smith, and Smith would know. In Week 1, Anderson completed 71 percent of his throws, with two touchdowns and no picks and a 108.7 rating, in a 20-14 Carolina victory at Tampa Bay. The rematch is in Charlotte, and the Panthers have a legit shot to win this horrendous division, and Anderson could be the bridge between the Cam Newton car accident and the last two games of the season. Anderson is the most important person in the playoff scenario this weekend. "See you Wednesday, I want you to have a great time. Smile! The theme don't change, baby, they're just back on the bandwagon. We all we got, 1, 2, 3..."
“It’s like a Grammy nomination. It's an honor to be nominated for a Grammy. Whether you win or not, it's an honor to be nominated. It's a major thing. So, if you're talking about the ballot, why is everybody on the ballot and they haven't had close to a Pro Bowl year? It should be an honor to be on the Pro Bowl ballot. How can you have a Pro Bowl season if you only played in 10 games, right? I wouldn't start the fan voting until after Week 13. … Everybody had 12 games and their bye by Week 13, so the fans had 12 games to see who's playing well, who's been on the field, you got two weeks to fan vote, and then let the media and everybody else vote. Why do they need two months to vote 500,000 times?" Wow. That is a beautiful, apt statement by a totally unfamous player who thinks: Shouldn’t the Pro Bowl be a real reflection of who played the best in a particular year, and not solely a popularity contest? 1. Reports on Cam Newton’s health. He has the same injury that robbed Tony Romo of a start earlier this year, and we can only assume that if the Panthers win Sunday against the Bucs that he’ll play the last two playoff-deciding games. But we shall see after this weekend. 2. The Heisman to be handed to Marcus Mariota. Nothing to see here. The only question is: Is Mariota clean enough, and good enough, to be picked ahead of Jameis Winston? 3. The preposterous NFC South. It’s possible, and indeed likely, that the four teams in the NFL’s Awful Division will be 5-9, 5-9, 5-8-1 and 2-12 by Monday night. That happens if Carolina beats Tampa, Pittsburgh beats Atlanta and Chicago beats New Orleans. 4. The wild and wacky AFC North. It’s unlikely, but possible, that the four teams in the NFL’s Sameness Division will be 8-5-1, 8-6, 8-6 and 8-6 by Sunday night. Man, I hope so. What a story that would be. 5. Johnny Football. Take out the tape of what Kyle Shanahan did with Robert Griffin III two years ago. Insert Johnny Manziel. That's what we’ll see Sunday, when Manziel makes his starting debut against the Bengals in Cleveland. 6. How can the Jets be favored in any road game? I need one of my gambling readers to answer this question: When is the last time a two-win team playing in December was a road favorite? The Jets find themselves favored at 2-11 Tennessee on Sunday … and the real winner could well be the loser in this game. With two quarterbacks likely to be high picks in the 2015 draft, and with the Jets and Titans both needing quarterbacks, wouldn’t it be smart for the coaches in this game to NOT win? Well, Rex Ryan will try everything to win Sunday, because he knows he’s getting fired after the season. But Ken Whisenhunt is likely to return. It’s to his long-term advantage to lose this game. Not saying that’s the way he’ll coach this game; he won’t. Just saying it would be better for Tennessee to lose this game than to win. 7. The Steelers turning a game in Atlanta into a home game. If you watch the Steelers-Falcons game Sunday, turn up the volume when Pittsburgh is driving. I bet it sounds pretty close to Heinz Field after a touchdown. Atlanta loves the Steelers. 8. Green Bay at Buffalo. I love this game. Just love it. Aaron Rodgers has never won in Buffalo—come to think of it, he’s never played in Buffalo—and he’ll be facing the most dangerous front in the game. You know and I know and the vast majority of western New Yorkers know it’s a long shot for Buffalo to be able to score enough to win. But think of this: Every nine snaps, the Bills sack the quarterback. That’s a lot. So Rodgers may want to use a lot of Eddie Lacy. Just a tip. 9. San Francisco at Seattle. Funny. This was the best rivalry in football about five months ago. A little less tasty today. 10. The Patriots, as always. New England will try to win its 11th AFC East title in the past 12 years Sunday by beating Miami. My only question is: You mean they haven’t won the AFC East every year?